The second Sunday of the 2018 NFL regular season is in the books and with it came some memorable performances on both sides of the ball. Following every Sunday this season, we at Pro Football Focus will scour our data from our team of over 500 analysts who grade every player on every play of every game and point out the most notable statistics from our wealth of data. 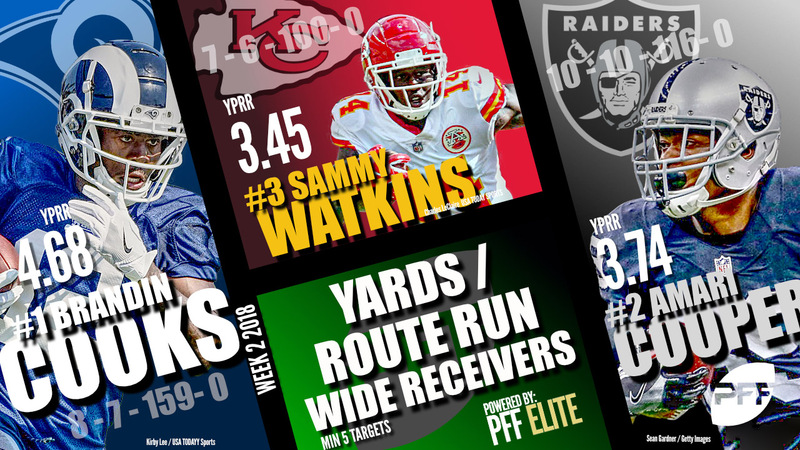 During our grading of every player on every play, PFF’s grading generates a bevy of advanced statistics found within our Premium Stats 2.0 platform, available with a PFF Elite subscription. Below are 20 signature stats to know from Week 2 of the 2018 NFL season. Each of these stats comes to you after our grading and subsequent All-22 review processes are in the books. Carr put up historic standard completion percentage numbers in his Week 2 matchup against Denver as he also led the league with a 93.8 percent adjusted completion percentage. He completed 29-of-32 passes with one dropped pass giving him his league-high mark. Rivers was pressured on 40 percent of his dropbacks (12-of-30), the fourth-highest rate in the league for Week 2, yet he finished the game against Buffalo with the league’s highest passer rating under pressure at 153.7. He completed 8-of-9 passes for 108 yards and one touchdown under duress. To no one’s surprise, Mahomes led the league in not only deep passing yards but also deep passing touchdowns in Week 2. 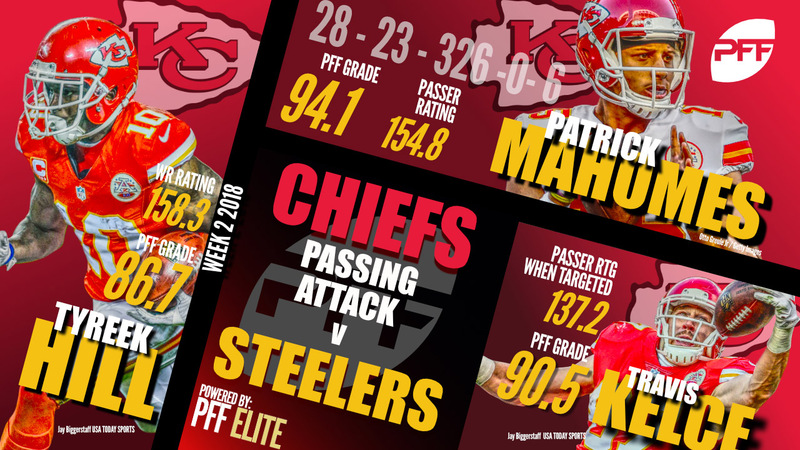 On passes targeted at least 20 yards downfield, Mahomes threw for 140 yards and three touchdowns. On his 14 carries, the rookie from Colorado averaged a league-high 6.36 yards after contact per carry. He racked up 89 of his 107 rushing yards after first contact en route to a 759 overall grade which was good enough for second on the week. The second-year running back broke out to a league-leading 190.8 elusive rating against Green Bay, the PFF metric that isolates a running back independently of the blocking in front of him. He forced eight total missed tackles on runs and receptions while he averaged 3.10 yards after contact per attempt. Breida earned a spot on our Team of the Week from his performance against the Lions as he recorded three breakaway runs (15-plus yard carries) for a league-high 114 yards on such carries. Brown forced four missed tackles after the catch on Sunday, leading the league’s receivers. After two weeks, he’s now forced or avoided five missed tackles to also lead the NFL. Cooks averaged 4.68 yards per route run on Sunday despite running 34 snaps in route. He currently finds himself fourth in the league with a yards per route run average of 3.67 this season. Buoyed by his 75-yard touchdown to open the game against Philadelphia, Jackson led the league’s receivers with his 103 yards on deep passes in Week 2. He now has recorded 232 yards on deep receptions through two weeks, leading the league by nearly double the next closest receiver (121; Julio Jones). Brown led the league’s receivers by averaging 4.50 yards per route run from the slot. He could have put forth an even more impressive number had he not dropped his other catchable target from the slot. James led the league’s tight ends with his 138 receiving yards, also pacing the NFL with his 4.93 yards per route run. He ran 28 snaps in route, hauling in five receptions in the Steelers loss to Kansas City. Doing his best to anchor an offensive line decimated by injury, Moton led the league’s tackles by logging 50 snaps in pass protection without allowing a single QB pressure on Sunday. Going up against the formidable interior line of the Chiefs, Finney did not allow a single QB pressure. He led the league’s guards who did not allow a pressure in Week 2 by logging 63 snaps in pass protection. Known for his disruption as a pass-rusher, Donald dominated against the run in Week 2. He spent just 10 snaps in run defense yet registered four run stops, giving him a league-leading 40.0 percent run-stop percentage to lead interior defensive linemen. Casey dominated the pass-rush from the defensive interior on Sunday, recording eight total pressures. He brought in two sacks and six hurries for a pass-rush productivity of 16.1 to lead the position. 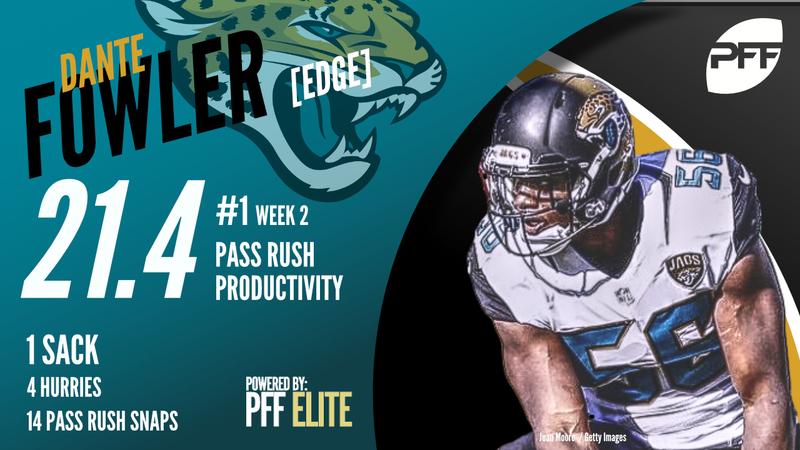 Fowler rushed the passer 14 times on Sunday against the Patriots, coming home with five pressures including a sack and four additional hurries. His 21.4 pass-rush productivity led all edge defenders this weekend. On just 16 snaps against the run on Sunday against the Bucs, Graham recorded a whopping four run stops. His 25.0 percent run-stop percentage ranked him first among edge defenders with at least 15 snaps in run defense. Scandrick spent 58 snaps in coverage against Pittsburgh, was targeted eight times yet only allowed one reception for zero yards. His 58.0 coverage snaps per reception allowed not only led the league in Week 2, but it was also a clear 8.0 snaps higher on average than the next cornerback. Lost in the impressive performance in the passing game from the Bucs offense and defense was the performance against the run from the rookie out of Pittsburgh. Whitehead logged just 10 snaps in run defense but recorded a stop for an offensive failure on three of those snaps, leading the league’s safeties with a 30.0 percent run-stop percentage.